If you've ever visited this blog before, it should be clear to you by now that we at GeekTech love Lego. And why not? It's probably the ultimate geek toy out there. The Internet seems to agree; just look at all the great ideas springing up on Lego Cuusoo for sets, or entire blogs dedicated to people's creations. Rather than inundate you with all the great Lego stories this week (it's impossible to write an entire story for each of them--there are so many), here is a quick rundown of all the project you must see--or make yourself. 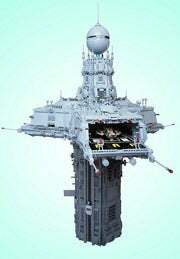 If you're looking for detailed Lego builds, check out the Triport Spire by Tim Goddard. Sadly, we weren't able to find out a whole lot about this spaceport build, but you can definitely appreciate it! A whole lot of bricks must've gone into this build, which features a working elevator and even a lighting system. You can see more close-ups of the Triport on Tim's Flickr page. Speaking of spaceports, an awesome new project launched on Lego Cuusoo: NASA Deep Space Habitat and Rover. This proposed set is based on the real-life Habitat Demonstration Unit project, which is NASA's program to develop living and working quarters for future space missions. The best part is that, like the real thing, you can take this set apart and rebuild it in various different configurations. The proposed set needs supporters, so make sure you give it the thumbs up. Fans of Lego and Mario alike will enjoy making this one for themselves--a Question Block that reveals a power-up mushroom once opened. Chris McVeigh provides step by step instructions and part lists so you can build along. The Mario build makes use of 90 parts available on Lego's Pick-a-Brick, and there are 48 steps on the instructions page to get you going. Another big children's brand other than Lego is Pokémon, so merging the two together had to happen at some point. Lego Cuusoo member "retinence" assembled an awesome water Pokémon set--and no, it isn't a stupid Magikarp. 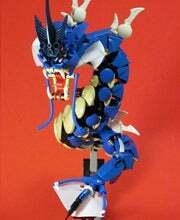 Retinence used Hero Factory bricks in order to create the spiral skeleton shape of the serpent, who happens to look pretty badass in Lego. Retinence is looking for help regarding the joints of the beast though, so give your advice over on the site. This has to be the most impressive build of the week. 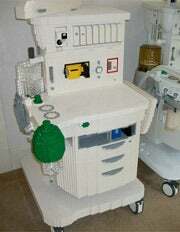 The Lego Anesthesia Machine is the same size as a real-life setup, and requires 30,000 bricks (!!) to create. Eric Harsburger made the machine after GE Healthcare requested a model for a tradeshow, and it took him around 5 months to complete. Every important detail is there, from wheels to the pull-out trays underneath the machine. Check out Eric's website to learn more about this build, and to see more photos. Got something you want to show off? Why not tell us about it?